Home Good deal on the ModTone Clean Boost! Good deal on the ModTone Clean Boost! This morning I stumbled on a good deal on the ModTone Clean Boost pedal. Clean Boosts are a great way to get some growl out of your preamp and to get some nice tone from the amp (not the pedal). The point of a clean boost is to increase the signal from the guitar to either the amp or the pedal afterwards. They’re designed to preserve tone of your guitar, but increase the signal strength. If you’re running a tube amp, clean boosts are absolutely great to have. The ModTone Clean Boost is exactly that, a clean way to boost your volume. Designed along side a US effects modification company, the ModTone Clean Boost offers up to 25 db of volume boost without adding any distortion to your signal. The Clean Boost also features an added Tone knob allowing you to also use it as a Bass or Treble boost. It also works great for your acoustic/electric guitar if your guitar does not have onboard volume and tone controls. The ModTone Clean Boost will run great in front of your amp, but throw it in the Effects Loop to maximize its potential and boost your rig to new heights. 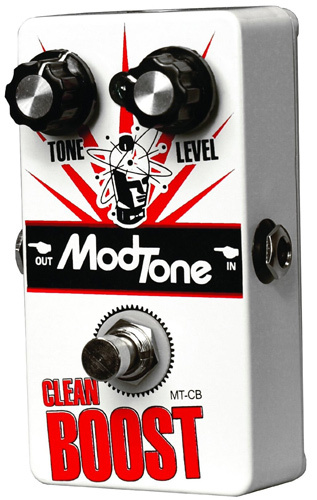 That deal that’s going on … the ModTone Clean Boost is available for only $65.55 at Amazon and that includes FREE shipping. At the time of this posting, there were only 7 units remaining, so if you’re interested.. you better jump on it. Once the unit count drops down to 1 or 2, the price usually jumps back up. If you own a ModTone Clean Boost, please let us know what you think by commenting below!